In my upcoming novel (the third of my Alpine Grove romantic comedies), the main character is a veterinary technician. In the opening scene, she is dealing with a very large flatulent cat named Squiggy who is not cooperating with his examination. Although obviously, I added in some humor (my books are romantic comedies after all), the scene depicts something important. Part of being a good pet parent is bringing your pet to visit your veterinarian regularly. After the BlogPaws conference, one of the exhibitors, Partners for Healthy Pets, emailed me to see if I’d be willing to post about preventive healthcare. You can prevent a number of serious problems like obesity, diabetes, and heart disease if you take your pet in for regular health checkups. If you’ve ever wondered what your vet is up to with all that peering, poking and prodding, check out the HeathyPetCheckup.org site. It has a great description of what your vet is looking for during a checkup. I’ve written many posts over the years about dangers that lurk in your house. Pet proofing and toxic plants, holiday safety issues and so forth. But today I found out about another seemingly innocuous thing that can hurt your pets: plastic bags. According to the Preventive Vet site, pet suffocation on snack bags happens far more than people might expect. It can take as little as 3-5 minutes for a pet to die from suffocation. Fiona and Kaylee think that corn flake is very interesting! If your dog is a counter surfer, make sure that you keep all your chips, pretzel, cereal and other bagged foods in plastic containers or out of reach. Make sure you either make it impossible for your pets to get at the empty bags in the garbage or cut up the bags. Our kitchen actually has a special snack drawer that has a metal box in it with a sliding top. It’s undoubtedly designed to keep out rodents, which at our house is a very good thing. 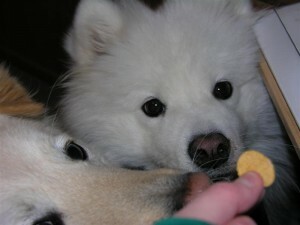 But it also keeps Fiona the fuzzy and extremely piggy Samoyed away from plastic bags that could hurt her.